The hilly land around Bethanga was not particularly attractive to agriculture, but in 1875 gold was discovered there. The resultant township, named Upper Bethanga, was north-west of the present town. It occupied a narrow valley. 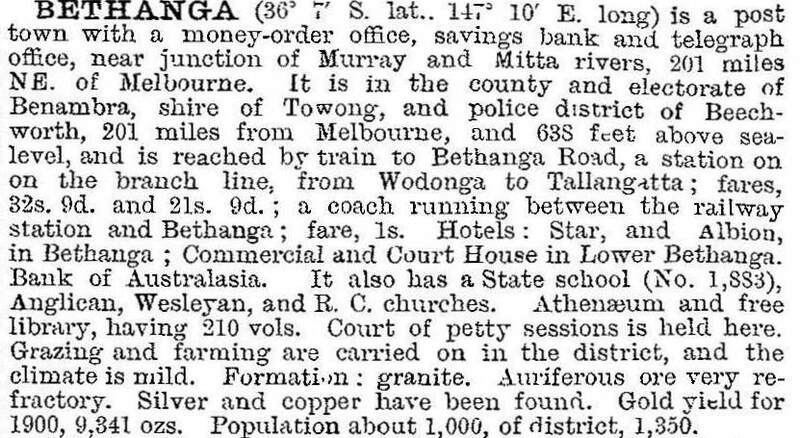 Four years later copper was discovered, and an adjoining settlement of South Australian/Cornish miners arose, ultimately expanding to become Lower Bethanga and the present town. A public hall was built in 1876 and was used for a primary school (1877). Within a year the hall was far too small for the school population, and teaching was transferred to the Wesley church. The move caused a storm of protest, partly arising from the split between Wesleyans and Methodists and partly from residents of Lower Bethanga objecting to the distance to the school at Upper Bethanga. It was also near objectionable hotels and wine saloons. The transfer of the school in 1887 to the site nearer to Lower Bethanga probably signalled, more than anything else, the town’s future site. A less evident signal was the action by the Wallace mining interests in releasing arsenical and sulphuric mine waste near Upper Bethanga, which was stopped only by the townspeople taking court action. (John Wallace was a mining entrepreneur and local parliamentarian). The mines closed in 1911, and the census population ten years later was 40% less. Upper Bethanga was but a scatter of buildings by the 1930s, but both it and Lower Bethanga had separate post offices until 1952. In 1936 Lake Hume was opened, and extended in 1956 to enclose on three sides the land around Bethanga. As the largest settlement in the area, Bethanga has retained most amenities. It has a hotel, a general store, a public hall, Anglican and Catholic churches, a sports oval and a school (51 pupils, 2014). The Bethanga bridge (1930) across a western arm of Lake Hume is heritage listed and was upgraded in 2005.